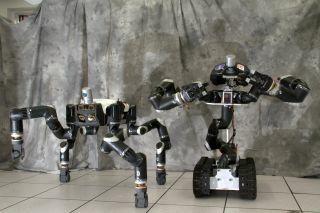 NASA's ape-like RoboSimian (left) and new Surrogate robot were developed by engineers at the agency's Jet Propulsion Laboratory in Pasadena, California. RoboSimian will compete in the 2015 DARPA Robotics Challenge in June. A NASA team is putting the finishing tweaks on its amazing, and somewhat creepy, climbing robot RoboSimian, a four-limbed automaton built to compete in a U.S. military robotics challenge in 2015. RoboSimian will compete with other robots in the DARPA Robotics Challenge, a contest that tests robots in disaster response scenarios to see how they weather situations that could be ultra-dangerous for humans. The contest will occur in June. "It comes down to the fact that Surrogate is a better manipulation platform and faster on benign surfaces, but RoboSimian is an all-around solution, and we expect that the all-around solution is going to be more competitive in this case," said Brett Kennedy, principal investigator for the robots at the Jet Propulsion Laboratory, in a statement. JPL is managed by Caltech for NASA. RoboSimian ambles about on four limbs and can easily climb or navigate difficult terrain. It is also equipped with up to seven sets of camera eyes on its front, stomach and sides. Surrogate, which was created out of RoboSimian's spare parts, has a more flexible spine that stands upright, allowing it to manipulate objects. But Surrogate has only two eyes and requires a track to move around, which means it would have trouble climbing a flight of stairs. In the competition, RoboSimian's tasks will include driving and leaving a vehicle, moving over debris in a doorway, cutting into a wall, opening a valve and also navigating a field with debris in it, as well as a surprise task. It's part of JPL's desire to create robots up to performing in dangerous environments, such as inside a nuclear plant or perhaps, one day, out in space or on another world. Although RoboSimian was already qualified for the challenge, it was only after six months of testing this year with the robot and Surrogate that JPL decided to go with RoboSimian for the competition. The finals will be held in Pomona, California in June 2015.